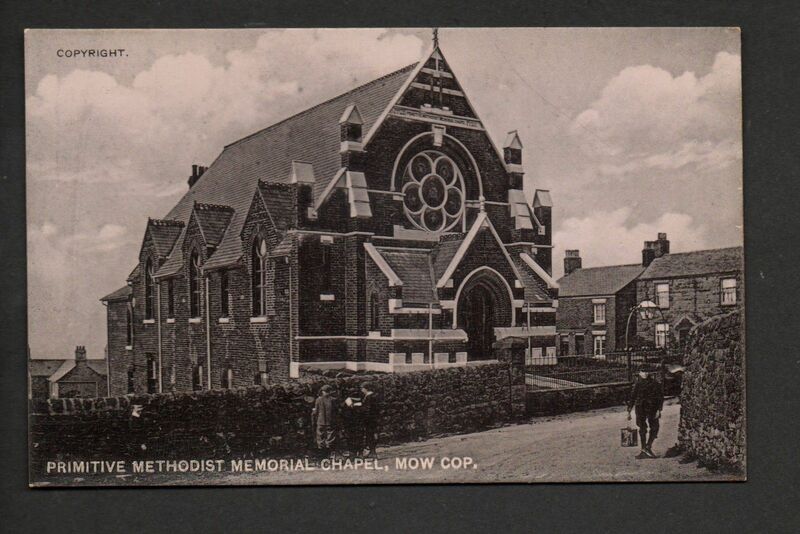 J The first Mow Cop Primitive Methodist Chapel was built in 1841 on the site later occupied by the Coronation Fustian Mill (a velveteen fabric makers). This chapel was too small by 1857 and so a new chapel was built on the part of the hill where the 1807 camp meeting was held, and next door to the farm where Hugh Bourne held his first prayer meeting. Originally opened in 1860 and partly rebuilt in 1882 due to storm damaged this site has witnessed many celebrations, particularly in 1907, 1910, 1957 and 2007, of the contribution made by Primitive Methodism to the world. As recently as 2007 over a thousand people gathered on the hillside on a wet and windy day for the bi-centenary celebrations.